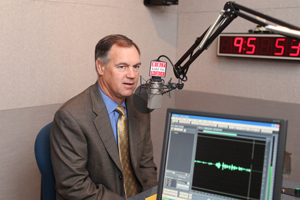 RodeoHouston is a huge draw for the city’s economy, says president and CEO Skip Wagner. On Bauer Business Focus – A conversation on the Houston Livestock Show and Rodeo with Andrew Schneider, business reporter for KUHF 88.7 FM. Known as the world’s largest live entertainment and livestock exhibition, the Rodeo has been an annual staple of the city since 1966. Last year, attendance hit a record high of 2.2 million. Skip Wagner, president and CEO of RodeoHouston, visited Bauer Business Focus recently to talk about the rodeo, the benefits it brings to the city’s economy and the many scholarships provided to Texas students. RodeoHouston is a huge draw for Houston’s economy, bringing in business from all over the world. But does it actually help Houston’s businesses? The key to whether or not it is beneficial, Wagner says, depends on outsiders coming in to spend money and whether that money stays within the community or moves out. Besides being a boon for the Houston economy, RodeoHouston is a major contributor to the education of Texas youth, providing $17 million to students, $9 million of which is from direct scholarship support. “It’s really for Texas kids who go to Texas colleges or universities,” he said. One of the biggest events for RodeoHouston is its live entertainers. So who is the president of the rodeo’s favorite performer?